My recent travels got me thinking about what to wear when you are setting off on an airplane. Comfort is obviously key, but that doesn’t have to mean sweatpants, leggings, or other articles of loungewear. These pieces are much better left at home. (Please, please leave these at home!) I wasn’t able to get any shots of my own travel attire, but I’ve recreated looks above inspired by my own. The first outfit combines comfy trouser pants with a basic tank top. Comfy trousers look put together and modern without the feeling of being constricted during a long flight. I always get chilly on airplanes, so I recommend layering with a cardigan or a scarf, which can easily be removed and stowed upon arrival (if your destination happens to be tropical or warm like mine.) Another unfortunate effect of flying for me is that my feet swell, so I typically go with sandals to allow for this unlucky expansion. 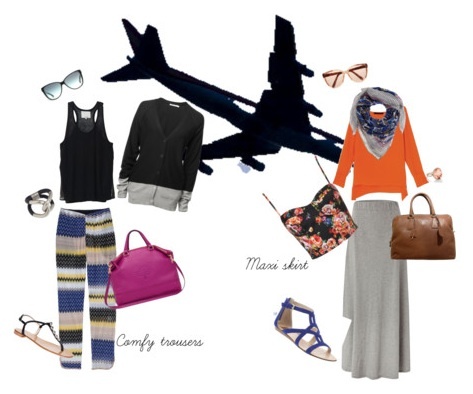 The second outfit I love for travel is designed around the very breezy and trendy maxi skirt. Pair a cotton maxi skirt with a boxy sweater and a scarf for optimal comfort. This will look wrinkle-free and chic throughout the trip. I added a fun floral corset top underneath for a totally new outfit upon arrival. For both travel looks, I did minimal jewelry because airport security is so strict now, and it would be hell taking off an arm party at every security check-point. I also added a big, roomy satchel where you can store your magazines, books, iPod, etc. for the flight. Let me know what your go-to travel style is in the comments. And stay tuned for some shots from my trip to St. Thomas!